This outdoor Industrial Grade Solar Flood Light – SMD (surface mount diode) LED’s is an excellent choice for your high demand or commercial lighting needs, can be configured as a Dusk to Dawn Solar Flood light, or as a Solar Powered Motion activated security flood light using the adjustable motion PIR detector. SMDs last longer, are more energy efficient and 17% brighter than standard LEDs. Long life Lithium Ion battery for superior lighting cycle time. This Solar Flood Light is ideal for lighting an area approximately 30' Wide x 50' Deep. Ideal for use in illuminating signs, parking lots, and driveways. Estimated light output is approximately 200 watts. The Lumen measurement is 780lm (6~7lm/pc). This light turns on Automatically turns on at night and off at dawn with an On/Off switch on light fixture for convenience. Depending on environmental issues (geographic location in US and weather temperatures) estimated nighttime hours of operation are 10-12 hours on a fully charged battery. This installation is suited for ground stake mounting of both solar panel and LED Light for ground effect lighting, up lighting walls or structures. Lamp Housing is Die Cast Aluminum with tempered glass 18 Volt, 10 Watt Poly Crystalline Solar Panel (13"x 11" x 1") 12 volt 7Ah Long lasting Ll-ion, Lithium Ion Battery. 15 Feet of wire between battery and solar panel and 15 Feet of wire between battery and light unit- both with water proof connection Photo Cell On/Off Switch. 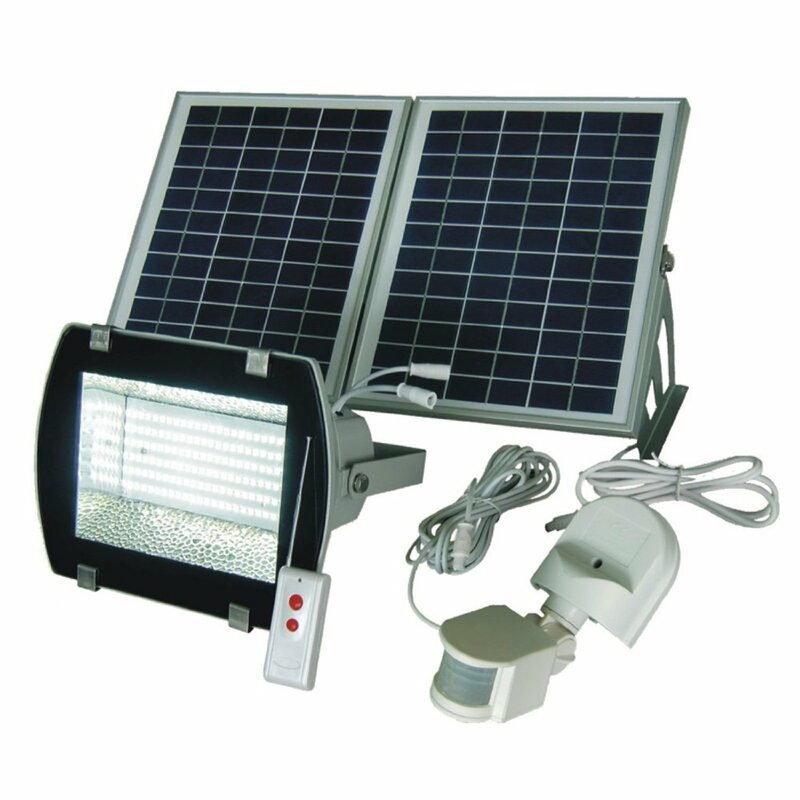 Manufactory Warranty: LED Lights - 3 years Solar Panel 1 year Battery, case, connectors and wires - 90 days. Flood Light Measurements: 11" x 8" x 7"
Solar Panel Measurements: 13"x 11" x 1"